"...I hardly ever so longed to live to God and to be altogether devoted to Him; I wanted to wear out my life in his service and for his glory ..."
^^^^Introduction by John Macarthur. David Brainerd was devoted to live for his Lord. He lived a short life but in his four years as a missionary he was blessed with a period of revival amongst the Indians to whom he had been ministering. By considering the life of Brainerd this book will be of tremendous spiritual benefit to you as you read of a young man plagued with depression and yet made so effective under God. 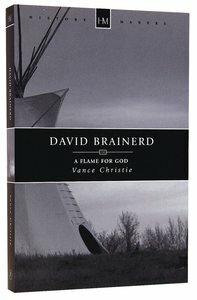 About "History Makers: David Brainerd (Historymakers Series)"
David Brainerd was devoted to living for his Lord. He lived a short life but in his four years as a missionary he was blessed with a period of revival amongst the Indians to whom he had been ministering. By considering the life of Brainerd this book will be of tremendous spiritual benefit to you. Introduction by John Macarthur. David Brainerd was devoted to live for his Lord. He lived a short life but in his four years as a missionary he was blessed with a period of revival amongst the Indians to whom he had been ministering. By considering the life of Brainerd this book will be of tremendous spiritual benefit to you as you read of a young man plagued with depression and yet made so effective under God. Explore the life of America's first foreign missionary, Adoniram Judson (1788-1850), who was devoted to serving God for over 38 years in Burma, no matter the cost. The son of a congregational minister, Judson was a precocious young man who aspired to gain exceptional worldly fame through some prominent secular career. But following a crisis of faith and a stunning turn of events that exposed the vanity of mere temporal pursuits, he went on to study for the Christian ministry and to dedicate his life to missionary service. With unshakable faith in God and His Word, Judson persevered through staggering difficulties. His unremitting labor and devotion were used of the Lord to spread the Gospel and to establish healthy Christian congregations throughout Burma. Judson's example was an inspiration to untold thousands in his own day and still has the power to encourage and instruct believers today. D. L. Moody was the greatest evangelist of his era. Pollock's skills as a biographer are at their height in this vibrant biography. "By the time the reader has finished this book he has the impression that he knows Moody, and even shaken hands with him." - New York Times. The name of George Muller has become a byword for faith throughout the world. He depended on God for every penny of the cost of the orphanages he founded. Under no circumstances would any individual ever be asked for money or materials. His seemingly impossible success is as much an example to our generation as to his own.